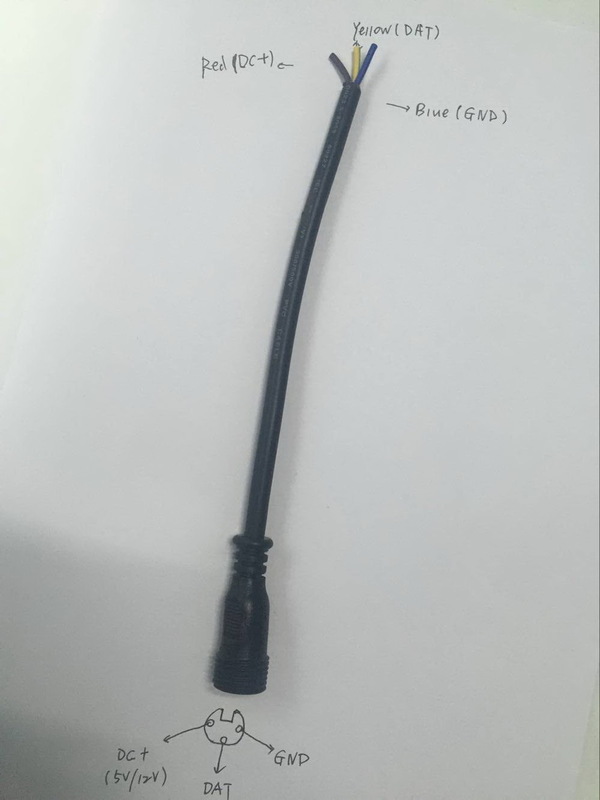 ï»¿ 3 Pin wiring For floods? Anyone have the round 3 pin wiring schematic for these? Re: 3 Pin wiring For floods? I assume that they are wired similarly to Ray's Pixel strings. The end with the Male plug is D in. If you attach a mating female plug to it, Brown will be V+, Blue V- and yellow/green is data. This is assumption only, YMMV. Thanks! That's what I assumed. but you know what assume does! At least for me! I found this video which shows someone that's pulled it apart and is running it with V+/V- from a power supply and the Data signal in from a Raspberry Pi. If you pause it in a few spots you can see the twisted pair is coming from the power supply and the green wire is coming from the little experimenter's breadboard, which I assume is coming from the RaspPi. The point is, you can easily take yours apart and see where the Male plug's wires are landed, you can match it to the video. There are several videos on YouTube showing how to take the Flood Lights apart: Four screws to remove the glass cover, and 4 more to release the foil lens. Let us know how you make out with your project! ...and God said: "Let there be light to divide the day and night and be a sign of the seasons! ", and thus he created the Blinky Flashy.